(CNN) -- Sean O'Hair will take a three-shot lead into the third round of the Arnold Palmer Invitational at Bay Hill with five-time winner Tiger Woods handily-placed ahead of the weekend action. 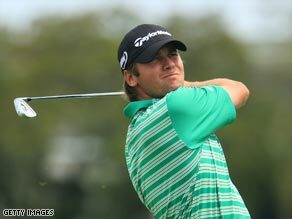 O'Hair played superbly in the testing conditions to buld a commanding advantage at Bay Hill. O'Hair, who opened with a 67, followed up with a five-under 65 for a halfway total of 132 (-8). Overnight leader Jason Gore stayed in contention with a level-par 70 to hold sole second place on five-under -- with Robert Allenby of Australia (65) and Ryuji Imada (66) tied for third. But they will all be looking over their shoulders at defending champion Woods who carded a 69 to hold fifth place, five adrift of the leader. British Open and U.S. PGA Champion Padraig Harrington, who was paired with Woods, also moved into contention a shot further back after a 68 in tough scoring conditions. "You can make bogeys in a heartbeat out there today," Woods told the official PGA Tour Web site www.pgatour.com. Woods endured another difficult day from tee to green, but again compensated with superb form on the greens, needing just 25 putts, to stay in touch. The world number one is playing the third tournament of his comeback after a nine-month injury layoff and is building up to the U.S. Masters next month. O'Hair, who might have been further ahead but for a bogey on his final hole, enjoyed the challenge. I've always been a good wind player, just because I'm from west Texas, so I'm used to wind," he told PA Sport. "Florida is like nothing compared to Texas. You know, I'm very comfortable playing in Florida. I've lived here for a little bit and played a lot of junior golf here, especially at this golf course, and it's a place I feel very comfortable." he added. Vaughan Taylor carded a hole-in-one at the par-three seven on his way to 68, two under for the week in a tie for sixth with Harrington and his fellow Americans Lee Janzen, Hunter Mahan, Nick Watney, Mark Wilson and Tim Herron, the 1999 champion at Bay Hill,. Last week's PGA Tour winner Retief Goosen of South Africa just made the cut on five-over-par.